Looking for cold weather fun for the kids? When winter finally arrives in the Capital Region, there are always plenty of outdoor activities to discover, including alpine skiing and ice skating at the Empire Skate Plaza. However, as you know, winter presents a few different risks than during other times of the year. From frigid temperatures to thin ice, learn about how you can ensure your kids have fun this season and stay safe. Before you let the kids outdoors for any kind of winter activity you should have them dress in the proper clothing. 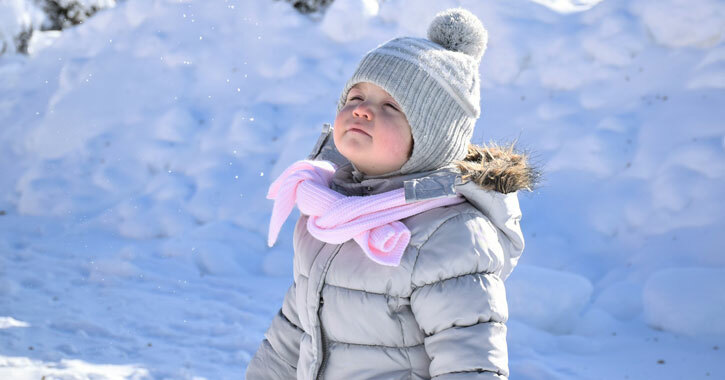 Winter temperatures typically range between just above freezing to below zero, and if your kids are going to be outside, you'll want them protected from the elements. Winter clothing should be warm and consist of removable layers. The main source of protection will be a waterproof outer layer and a moisture-wicking inner layer, and the other recommended items of clothing include snow boots, gloves or mittens, and a hat. Have your kids play indoors when weather conditions are too extreme. Temperatures around -16 degrees Fahrenheit are too cold for kids. Make sure your kids stay dry; check their clothing every now and then. Kids should take regular breaks; have them come inside for a warm drink. In winter, kids shouldn't play alone outside. Kids under 8 should be supervised by an adult. Do not get close to snowplows and snow blowers. Do not play near roads, fences, or open water. Be cautious if you have to cross a road; slippery roads can make it difficult for vehicles to stop or slow down. Do not climb on snow banks near roads. Do not throw snowballs at people or cars; throw them at trees and snowbanks instead. Only build a snow fort or tunnel if there is an adult watching; both can be very dangerous. Never put a metal object in your mouth when temperatures are cold. Do not eat snow off the ground. Do not stand under roofs with dangling icicles and heavy snow. The Capital Region is full of great skiing and snowboarding opportunities for kids. To the south, you'll find Hunter Mountain and Windham Mountain, and to the north, there is Maple Ski Ridge, West Mountain, and Gore Mountain all the way up in North Creek. While some are farther away than others, they're definitely worth a family road trip. Wear a ski helmet, wrist guards, goggles, and proper winter clothing. Remember to watch out for other people and obstacles on the slopes. If you're afraid of going too fast, practice on a beginner trail. Don't stray from the marked ski area and trails. A parent should supervise young children. Although you have quite a few indoor and outdoor ice skating rinks to choose from in the Capital Region, the most popular one in Albany is the Empire Skate Plaza. This outdoor rink is perfect for families looking to go ice skating together in winter. Very young kids should wear a helmet in case they slip on the ice. Ice skating is all about balance, so if your kid is just starting out, hold their hand or have them skate around the border of the rink. Indoor rinks are usually smoother than outdoor rinks, making them much better for kids learning to skate. Start by teaching kids the two-foot glide, moving one foot and then the other. Try to use the edge of your skates to turn. To slow down, crouch and turn the front of your feet inward. Whether you enjoy sledding or snow tubing, you'll find a fun hill in the Capital Region. There are local ones, such as at the Capital Hills Golf Course, and larger tubing parks in and around Albany. Some examples are Windham Mountain, Maple Ski Ridge, and West Mountain. Do not let your kid go down an icy sledding hill. Stay away from hills near roads, trees, fences, and other obstacles. Watch out for other sledders; have your kids move out of the way once they reach the bottom. If possible, have one parent at the top and one at the bottom of the hill. Kids under 5 should not sled alone. A ski helmet can be helpful for younger children.